Todd Watson scored all the runs Howard University would need on this day in March 1989. Watson scored twice, while picking up three hits against UNC-Wilmington. The second run came after a ninth-inning double, Watson soon going in for the score on a balk. Thanks to Watson, it was a game Howard went on to win by a score of 2-1, according to The Wilmington Morning Star. Watson would go on that year to turn pro, signing with the Reds. His pro career, tough, would be brief, just two seasons. Watson's career began as a 14th-round pick by Cincinnati out of Howard. At Howard, knocked in four runs in a February 1988 contest. He also picked up two hits in another March 1989 game. 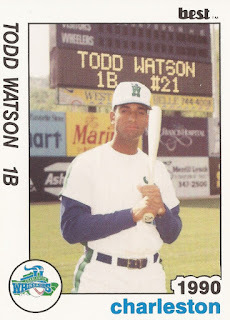 With the Reds, Watson started in the rookie Gulf Coast League. There, he hit .290 over 61 games. He hit one home run and knocked in 41. He moved to single-A Charleston for 1990. Watson helped set up a July run with a ground out. In a June game, he went 1 for 4, knocking an RBI double. Overall, Watson got into 105 games, but his average dropped to .235. He hit another two home runs and had 44 RBI. It was his final season as a pro.